As is evidenced by my many Flickr photos (see the flash badge to the right side of the blog), and from previous posts about my obsession with the underground graffiti art scene in Philadelphia, I've been photographing and documenting, tracking and treasure hunting these for well over two years. As I post more of my findings to Flickr and join Street Art and Philly Sticker groups, I seem to acquire more the collaborators and artists as "friends and contacts". So imagine my surprise when I was streaming through some of these guys photos when I find a picture of this on the artist known as DASHDOE's photo stream feed. He calls it "Shout Out Mini Style". My Flickr handle is Neenyd03 - and that's what I'm hoping Nate will call me as he gets older, Momma Neeny or just Neeny. The artists don't personally know me, but I feel a sort of connection to them, especially as I find more and more of their works. Well you could have knocked me over with a paint brush when I saw this little creation. I've been beaming for over 24 hours now! 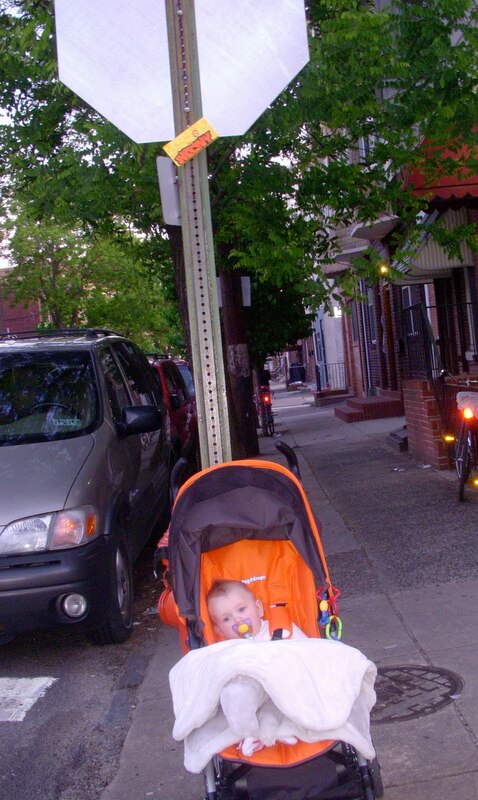 The exact location wasn't listed but it was noted that the installation was in South Philly on 7th Street. Now, as I find most of these pieces on my two mile commute to work and all around Rittenhouse Square, I had a good idea that it might be located fairly close to where I live. So I bundled up Nate and strolled him down 7th Street, taking photos, finding other street art installations, random old signs and other oddities along the way. I had a feeling it would be located before Washington Avenue and sure enough, there it was at 7th and Federal Streets. Little old me, a 43-year old mom, triathlete and food blogger, having graffiti and street art painted in my honor! I feel so pleased and touched. Thanks guys!